Virtual Reality Theater gives event guests the opportunity to experience the thrill of VR, complete with sound track and sponsor signage. 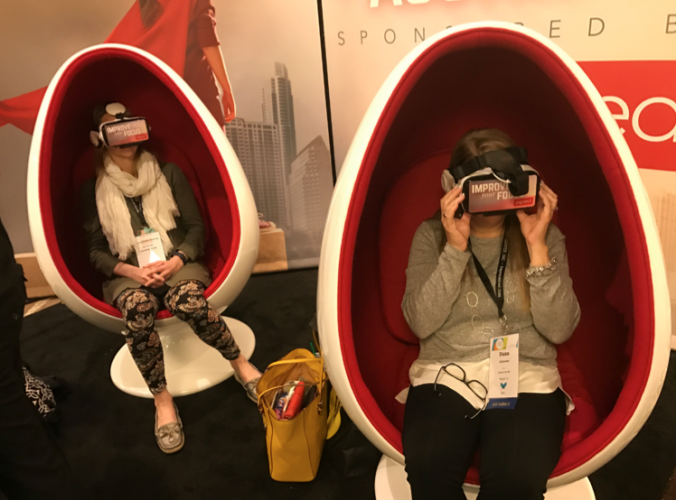 Be the first to provide the VR experience to your clients. VR Theater is set up on the show floor, in high traffic locations. Bold signage will promote the sponsors for all to see. VR Theater is perfect for showcasing properties, manufacturing processes, travel destinations and action adventure. Brand Immersion – Immerse your clients in your brand. Each prospect spends 15 minutes at this promotion. Your brand, your banner, scripted brand ambassadors and this engaging experience will envelope your clients. You message will be heard and remembered. Data Capture – As attendees que for service, sponsors take advantage of this idle time by collecting sales survey information or for product education. All guests must answer sales qualifying questions to participate. Your sponsor creates the questions, we report them. Advertising Features - Bold signage will quickly identify the proud sponsor of Virtual Reality Theater. Uniformed and scripted brand ambassadors will meet and greet your guests. The take home photo and social engagement features are completely customized and branded.